The Upper aquifer is composed mostly of sand and gravel, with some fine-grained lenses, and includes material deposited by glacial meltwater, glacial outburst floods, and streams. The Upper aquifer consists of sand, gravel, and cobbles along the Little Spokane River and in much of the Diamond Lake area. The aquifer is generally finer grained, consisting mostly of sand, in the Deer Park area, and in areas farther from main outwash channels. Where the unit is thin and insufficiently saturated, wells penetrate the Upper aquifer and are completed in deeper units. The Upper aquifer occurs on about 32 percent of the surface area of the basin and varies in thickness from 4 to 360 ft, with an average thickness of 70 ft. 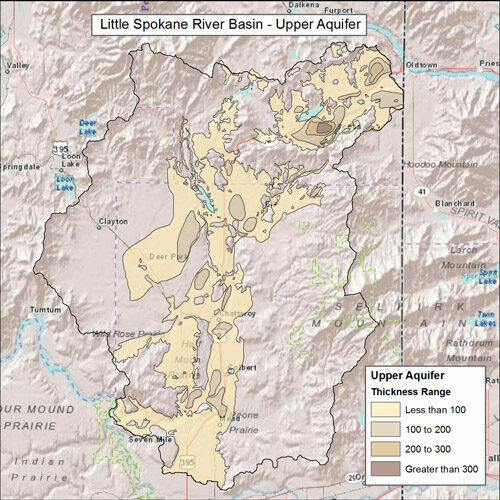 The unit is thickest along former outwash channels, including the channel now occupied by the Little Spokane River, and in the Diamond Lake area. WRIA 55 Upper aquifer extent and thickness. Delineated in USGS Scientific Investigations Report 2013-5124.